As you may or may not have picked up from my previous posts, I tend to have a love hate relationship with water. Some days I love it, and I can drink my 8 glasses without even thinking about it. Other days I have trouble drinking even a glass, and I find the plain taste of water incredibly unappealing. I like to keep some more exciting drinks around for days that I have this issue, so I'm always on the lookout for low calorie drinks (without artificial sweeteners) that have an interesting flavor (like hint water), health value (like herbal tea, or zenergize), or bubbles (like carbonated water). 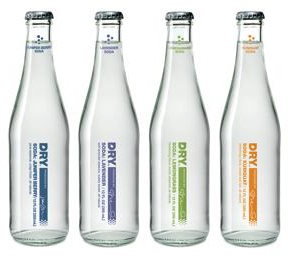 I recently found a line of all-natural bottled sodas at Whole Foods called DRY Soda that are relatively low calorie and pretty tasty. The flavor I like is called Lemongrass (which is subtly sweet in a really refreshing way), but the soda also comes in Vanilla Bean, Juniper Berry, Lavender, Kumquat and Rhubarb. The sodas vary from 50-70 calories per bottle (which are 12 ounces so 1.5 cups), depending on which flavor you buy. As I mentioned, I found this soda at Whole Foods, but I read on their website that it is also available at Bev Mo as well as various other retailers. PS. In the non-water drink department, I'm also a big fan of low calorie Izze Esque soda, Mint water, and Fizzit, as well as making my own fruity flavored water using real fruit like they do at the spa. Cool! There's a new vitamin water coming out called "vitamin water 10" (or something like that). It sounds like it'll be good. I'm glad that I drink a lot of water and I feel I need it and enjoy it. I generally have trouble getting all that water down each day as well. Add just enough cranberry juice to get the flavor I want without the points. Squeeze some lemon juice in. Buy flavored seltzer, which is usually much cheaper and lower in points when compared to other low cal designer drinks. Drink V8 High Fiber. You can have a glass of it for zero points, and you can get credit for veggie servings and fiber in your diet at the same time! These look good, and the flavor choices sound so cool!! I'll be on the lookout for them. I'm with you. Just can't enjoy plain old water and I struggle to get even 1/2 of the amount I should. i could give that a try! As far as the cuties go - not yet. Hoping maybe next week? I'll let ya know! Am curious, what are the ingredients in this drink? Have you ever tried SoBe LifeWater? They have a 0 calorie version that is sweetened with Purevia, which is just a type of stevia sweetener. I drink a lot of water during the day, and I can get sick of it too, so when I found this stuff I was so stoked. It reminds me of a non-caloric version of vitamin water. Pure Cane Sugar means that it comes from corn or sugar beats. That is just the source of the sugar. I'm not sure how to read it vs. regular sugar. I will check around to see what I can find. I love Zenergize...the lemon and lime hydration version. I keep searching for a low or nor calorie beverage that's "just right". I used to have one, but it's not made anymore. It was only available at Walmart or Sam's Club--Ruby Red Grapefruit Burst. It was just great-lightly carbonated, light, not bitter ruby red grapefruit flavoring. Sweet, but not too sweet. It was pink and semi-opaque. Anyone get hooked on/miss it,too? It's OCD and neurotic, I know, but I still miss that drink. Its was pretty much all artificial, but Yummy and 0 calories. I went so far as to do some sleuthing and found out it was manufactured by Cott for use under the Sam's Choice Brand. I haven't found anything close. Sierra Mist (by Pepsico) just came out with a Diet Sierra Mist Ruby--but I can't even tell the difference from regular Diet Sierra Mist. Walmart-Sam's Choice--Cott--Bring back the Ruby Red Grapefruit Burst!!!!!!! Have you tried La Croix? Just carbonated water with a hint of natural flavor - comes in lime, lemon, and orange. Delish. Hits the spot for me when I want something that feels like soda. And it's water! woo-hoo!